I am pleased to say that I have been contacted by McClelland Galleries and every second Thursday from 11am I will be on the grounds learning about all the sculptures, artists and their materials and methods to help me be a great volunteer in the Educational Department. Imogen has great plans for this department which could see my duties enhanced in future to make use of my Diploma of Visual Art and Certificate IV in Training and Assessment. At the meeting to introduce us all to each other and give us a hint as to what we will be doing I had an enjoyable and informative time. We were given a tour of the current exhibition in the gallery which at present is the “Beyond the Self” portrait exhibit. As I learned more about the artist’s thinking behind the works and their personal and cultural backgrounds the individual sculptures, paintings, drawings, photographs and videos gained interest for me as a viewer and as a practising artist. This understanding of the artists along with a certain amount of research into the history and social issues in their country of origin helps to engage viewers with not only the artworks but the person behind it. The involvement and enthusiasm of the guide or facilitator is what will help to make the engagement more memorable. It may even inspire some to participate in some part of the arts a little more as their own personal interest or journey of exploration. We went out into the sculpture park after a hot coffee in the gallery cafe and went for a walk to start becoming familiar with the layout and some of the works. Even in winter the quiet and the tranquillity of the trails is really worth it. The encounter with pieces that you may have seen before can be like meeting up with an old friend, or can shine a new light on one (literally) as you see it in the setting of a different season. The park is always trying to move things around and introduce new works, as well as holding regular exhibitions, so there is always the chance of discovering something new as well. On a personal note, I love going for a walk to see the birds and look at the natural scenery in the park. I have taken photos there as references for paintings in the past and today found a few places I would like to go back to soon to do some more photography. It is also a great place to give your mind a bit of a rest or meet with friends over a lunch or afternoon tea with an “arty” theme for the day. I am looking forward to the workshops and educational sessions in the future. I have a Certificate IV in Training and Assessment and am hoping that I can pass on my love of art and some of the enthusiasm I have for it by being a part of some innovative and fun sessions. Volunteering at McClelland is a great win-win for me and the gallery – and visitors as well. I am very proud and grateful for this opportunity. Hopefully I will be able to blog and post editorials about events and my new experiences as they arise in the coming months and they will inspire others to come along and join in. As the Creative Director of my own division of our family business and the OH&S Officer I have to address these issues for myself and the business in general. With this in mind, I am going to select the two most commonly used materials in my arts practice during the last year and do my best to research them from manufacturer to disposal of any waste from usage. I use mostly Rembrandt Soft Artists Pastels. Rembrandt pastels are made from the purest pigments and mixed with the finest quality kaolin clay binder. No pigments containing heavy metals, such as cadmium, lead, and cobalt, are used in production which ensures that the pastels have no hard bits or sharp edges. This means that the dust from the pastels is mostly very safe. The only unfortunate thing is that they are made in Holland. I might add at this point that Europe has very high standards for recycling and manufacturing that requires companies to make sure that every part of their assembly and disposal of product is compliant with environmental regulations. Germany, parts of Scandinavia and Holland are especially strict. I have, however, started researching locally made pastels from an artist in Pakenham Victoria. He manufactures in a similar manner to Royal Talens, the company that makes Rembrandt. This will remove the transport issues as he sells through the internet and pastels can be delivered via Australia Post and payments completed using EFT. It is quite difficult to get a lot of details about how some of your materials are made, so I can only do my best in continually researching better quality at prices I can afford and hopefully locally made to help in lowering the cartage costs of these materials. Rembrandt work well on the paper and blend very well with other pastels that I am researching (Rusty Tone). Most supplies come from a wholesaler in NSW. The majority of the pigments come from Germany with some coming out of Asia. The sites above have many pages of information about pigments. Too many for me to start typing in information here. For anyone interested I suggest you go to the site and have a look just as I did. Returning to Rembrandt, they don’t leave a lot of dust so there is also value for money by less wastage. I am planning on capturing the dust in the future as the studio is gradually completed, as this can be used to make your own very good grey pastels varying from cools to warms. Because they adhere to the paper very well the framing is a lot easier as well and less fixative is required. On some works I use no fixative at all and still get well over ten layers of colour. The Rusty Tone pastels apply nearly as well on testing so far and happily work with the Rembandts. At the moment I sweep up the left over dust and put it into plastic bags that are saved from our shopping for re-using. The bags are then put into general art room rubbish as they are not considered to be highly toxic. The bags are sealed just to be absolutely sure they are safe. Pastel paintings can last for well over a hundred years, as we have samples from the Impressionists in France. Thoughtful storage and use of good quality paper means that they have a long “shelf life” and final disposal is not something I am thinking too hard about since I am trying to use better quality materials that should last. As an additional safety measure I recommend to students that they do not blow on their pastel drawings and paintings to remove excess pastel dust. They are told to tap the back of the paper. This avoids any prospect of breathing it in and having a reaction to the dust and helps with easy collection later. Some artists also wear thin rubber gloves to protect their hands whilst using pastels. When using the very staining colours this can be a good idea. We recently had a visit from a representative from Canson. He gave a very informative talk about the manufacturing of the papers that I use for producing pastel paintings. It is common for representatives to give flowery talks big noting the positives of their product so it can make it hard to be sure about how environmentally sound their manufacturing is. The problem is however, unless you go to the factory yourself, you have to take them at their word unless you can find some laws that they have broken or lawsuits that have been won against them for environmental damage. I find that if I buy better quality from reputable companies with a good long history in countries that I know are mindful of manufacturing practices, I have a better chance of dong the right thing. This is also good for me as I know I am producing quality art works that will last and my clients are buying something from me that I am proud of. Cheap product from countries that I know are not worrying about how they are impacting the environment are not worth the risk and I think don’t give the quality result I am looking for. If I find a product that is manufactured in Australia that is of equal quality to Canson Tex I will test it and see if it worth swapping over. Regarding disposal: When producing an artwork I try to use as much of a sheet of paper as possible as they aren’t cheap. Any small off cuts go into recycling as it seems so far to be accepted in the bins. Today as part of the Visual Arts Course we had the obligatory session about sustainability and environmentally sound work practice as artists. This is not a new subject for me as I studied OH&S last year in two separate courses. The additional topic here was planning a business that looks into where you source your materials from, how you use the tools and business infrastructure such as power etc and how you dispose of materials. Sound business means that you set up your business with low usage of things like power consumption and petrol as you can – as well as making sure that your footprint on the environment is as small as you can make it. From a business point of view it means your running costs will be lower and the business has a longer life. It also means that you are a responsible member of the society you are in and selling to. Our business is very young yet but we are building a premises that will be insulated so well that very little heating and cooling will be required. We are planning a new smaller van for pick ups and deliveries that will probably be running on an electric motor rather than petrol. We are planting trees on the property and landscaping. We are removing old sheds that were built using asbestos sheeting. We have a recycle policy set up in the office. We test our printers for safer inks. We use a recycle station for all old computers, printers, scanners etc. We are replacing lighting with lower voltage lights, we have replaced computers and monitors for ones that use less power. When we began rebuilding the old farm building for the business to use, we planned a thick floor that would make sure that the building would not only be very strong but also insulated from the floor up from damp and cold. Future plans include solar panels on the roof, installation of rain tanks and a septic system that is environmentally friendly and pumps clean water out onto the paddocks for good grazing all year round. We have plans for a ventilation system with exhaust fans and filters for the art room area to help make it more OH&S friendly. We are also planting trees and native bushes around the property to invite local wildlife back – this is working very well so far. The hidden side of running an environmentally sustainable and OH&S aware business is looking at the hidden issues. Do you keep your old monitor on the computer? Well if it’s an old CRT monitor it probably has issues with power consumption, it probably emits dangerous X-rays that are especially dangerous for pregnant women and the resolution is probably causing eye strain. Older computers and monitors also get hot and affect the heating and cooling of offices. Replacement of older materials and equipment can often be more environmentally wise as well as business smart. Disposal can take a bit more research but we are making good progress in this area. Today we looked at what makes Australian Art and Design unique. What makes us different to Europe or the USA for example? For the first part of the session we broke into groups of six to seven and were asked to discuss two questions. We identified several things that we think make up or influence Australian art and design. The influence of the Heidelberg School (Australian Impressionists) – I love their style of painting. Being an island continent, a massive amount of beautiful beaches. Over the last few years I have discovered the beauty of beaches in pastel! Great light all year round – I don’t have to suffer months of poor light through winter! Mild weather means that I can always find something to draw or paint. Our coastline is especially great all year round. I consider a single tree a great landmark, which in some places they are. I have discovered the beauty of some of our older buildings and bridges lately in Melbourne. I am on acreage and have livestock so I love being out with them. I also love researching and doing artworks in our beautiful outdoors. Appreciation of ancestors migrating here. I want to succeed to make my ancestors proud. They made the right choice coming here and I am so glad they did. The “have a go” way of thinking – I try lots of different styles and methods. My mum used to tell be to give it a go because if you don’t you’ll never know. I think that is an Australian way of thinking from her generation. Camaraderie of other artists. We can gather together any time of year to support and encourage each other plus exchange ideas about where our art is heading as Australian artists. I used to stay with my sister and her family in Healesville during the 1960s. I would disappear for hours into the countryside and hills. I loved the peace of the country, I loved exploring and finding wildlife and wandering through the back paddocks of farms and along creeks. I didn’t know at the time how much of a bank of knowledge and appreciation I was building up for later life. I started off loving to draw horses, as I had been a mad “horsie” person from about the age of three, however, it developed over time with all this wandering into placing the animals I loved into the landscape that I was growing to love. The landscapes then became seascapes and glimpsed of urban imagery, the wildlife and the plants. Then the mediums were added to as I discovered oils, watercolours, acrylics, charcoal and mixed media. All with their own way of showing things I become interested in. During the 1980s I went overseas several times. It was then that I really started to love Australia the most. I couldn’t wait to get off the plane in Melbourne and smell the air – that hint of gum trees that we often overlook in our busy lives. The light is different here, the colours are different. I missed gum trees, wattles & banksias, I missed the sounds of home, the animals and birds. Only when I went away did I understand how much I love being here. When I realised that, I understood that my art would always reflect one way or another my love of my home. When I came back to “fine art” a few years ago full time, this lifetime of acquiring of imagery and experience at last became a useful library to call on. I have been adding to it ever since. I have been able to start refining what I want to say and what I want to show in my art. It always comes back to those early years of wandering around loving the countryside, loving the beaches, excited by the animals and wanting to show others the colour, the light and the wonder I see. The big decision in the near future will be what I choose to market as part of my business and which bits I will keep just as art I do for myself. I haven’t quite worked that part out yet. Sarah Bond in her capacity at Melbourne University spends a lot of time organising cultural exchange via visual arts with nineteen countries in South East Asia. The 21st Century is the time to be keeping in touch with the Asian market according the Sarah. There is growth and interest in what Australia has to offer in the arts and Sarah believes that we need to be proactive in marketing and promoting in Asia. Supported by the Myer Foundation, Asia Link Promotes and organises cultural and art events overseas. They hold touring exhibitions, artist residency programs, writing programs, special programs and a variety of cultural and arts based events. They also send teachers overseas to teach and for cultural exchange. Artists, sculptors, photographers, potters and digital artists are all represented in various events.Most of these are curated and some require the artist to be present to talk about their works. Sarah said that public talks are now an important part of arts events in Asia. Artists are expected to be available to talk about their work and from the over 600 artists that apply in any given year, sixty are generally selected to go overseas. There are 10 artists in residency overseas at the moment. The most common time for these is three months, but Sarah said that some artist get quite attached to their home away from home and stay on for a lot longer. Artists often work collaboratively with local trades and artists for events and these are a great opportunity to learn about different methods and diversity of artistic practice. Organisations from overseas make their requirements and desires known to Asia Link and artists are matched to these for their project. The boom in interest in Australian art has boosted the art market here and overseas. Local artists are making names for themselves not only in Asia but Europe and the USA, as they are also looking at trends in this part of the world. Artists don’t have to be studying at Melbourne Uni to express interest in the Asia Link Program. They receive applications from all over the country. Cathy originates from the UK and is a highly trained and experienced artist and teacher. She has been the president of the Victorian Pastel Society an exhibiting artist and art teacher for twenty one years. I have had the privilege of attending demonstrations by Cathy where she showed her considerable skill in still life and portraiture and it was a delight to see her show her skills in seascapes. For the demonstration Cathy worked from a photo that she had taken in Tasmania. She stressed that this is not her favourite way of painting, like most of us she likes to get out and paint on site but that is not always possible, especially for a demo, so having a library of subject matter is a great help. You just have to try to recall the little details of a place that the camera may not pick up and it doesn’t hurt to put away the photo nearing the end of the work and completing it as an artwork with your own artistic additions. Cathy did stress though that not every great looking photo will make a great painting. You need to carefully look at the composition and colours, as they most probably will need adjusting. The enhanced photo for this demo was of the foreshore and looked very much like Pt Leo where we have been painting only this year. Cathy was working on Colorfix pastel paper and had chosen to used a mid blue to pick up on the blues in the sea and sky. It is also a nice complimentary to any warm colours you may lay into the work later. She moved the horizon line up nearer to the one third mark from the top and also cropped the photo down top and bottom to get rid of the huge amount of empty space. The sides of the path through to the beach were cropped and made uneven to create more texture and help the composition. The light was also changed to help create shadows and highlighted areas. Early blocking in helped to make sure that things were all relating to each other. This gives a nice flow to a painting so that nothing stops your eye in its tracks as you look around a scene. The pastels were used on their sides for good coverage and only applied lightly so that as many future layers could be used to build up the picture. Every pastel Cathy used was set aside in her “palette” so that she had only to look in there to go back to a colour she had used previously. It is interesting to note that as Cathy has a huge arsenal of pastels she only carries what she needs for any work. This required planning and really knowing your colours. Once done however, it leaves you free to smoothly get on with creating. So, working “big” with broad strokes in the beginning allows for changes in the composition if you like and builds up an image that you haven’t invested too much in, just in case you change your mind. Light application means that lots of colours can be laid over the top of each other to create very rich texture and atmosphere. The sea was done this way so that as the eye moves towards the horizon the colours can cool off and change as the light and distance has an effect on them. Pinks and mauves were put in where the wet sand met the water. Cathy said that if you really look at any beach you will see similar colours in the very wettest areas where the waterline is. As she worked on, Cathy said that she often gives trees etc haircuts or chops them out entirely if they are not working. She likes to keep the flow going and also uses shadows and streaks of light to help with this. The high key colours used initially in the blocking in stage also help with this flow, as they subtly show through in various areas. Cathy keeps all of her painting at the same level of completion. She says that this is important, and makes sure her students understand that you must work all around your work and not get bogged down in one corner for example. This will also help in moving your colours around and making sure that they are used in balanced areas. Move the colours around a bit. The whole painting needs to be looked at as a whole not lots of little bits that you hope will all start linking together when your done. As you work, don’t forget to go for a walk away from your painting. It not only give your eyes a break, but you can see the whole thing better from a distance and often can walk back into the studio and immediately see something that needs your attention. The very last things that should go into your painting are the little fiddly bits such as branches, twigs etc. You are telling a story, so less is more. You may not need to put in as much detail as you thought by taking care of the larger areas first and creating interesting marks with your pastels. An important little tip with pastels whilst working was keeping them clean. I noticed Cathy wiping hers a lot on her apron. It is not unlike keeping your brush clean or not muddying up your paints on the palette. The final sweeps to create highlights showed up so much better by Cathy keeping her pastels very clean. One final tip and a fun phrase: “The Power of Red”. Even though it was a seascape, a few dashes of red here and there really did pull the painting together. You only need a tiny bit, so it is really worth giving a go! On that note, the demo was over. Cathy, as always was fun, entertaining and very informative. She is a lovely person and an extremely talented artist and I had a good time. The monthly demonstration at the Berwick Artists Society was on the theme of Seascapes in Pastel. The artist was widely recognised and respected Catherine Hamilton. Catherine is a past president of the Pastel Society of Victoria and she has been teaching art for over twenty one years. As part of the evening members bring in their works for the monthly competition toward artist of the year in one of three categories. I am in Category A for experienced artists. 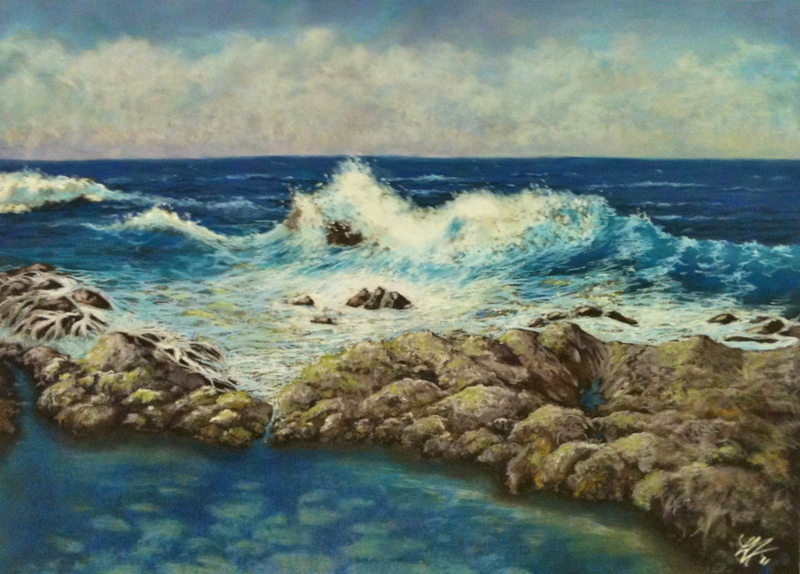 The work I took in for the evening was my big pastel called The Irresistible Sea. Catherine gave me a wonderful comment saying that the artwork was a beautiful painting. She also awarded it first place. A first place from an artist of the calibre of Catherine Hamilton is a great honour and I am still very happy a day later! I have posted a scan of the painting here for you to check it out. The editorial about the demo is also now in the blog. Kristen lives and works in Melbourne and her education includes a Bachelor of Arts (1972-76), Departments of Fine Arts & English at the University of Melbourne and Painting (1980-81) at the Victorian College of the Arts. she has been an exhibiting artist since 1982 and her works are in several prestigious galleries overseas and in Australia. A large part of her early work was inspired and drawn from photos that she saw in the newspapers from which she did a series of politically and socially based subjects mostly in watercolour. She has also used photography by an early 20th Century French photographer as the basis for a series of “parks”, drawing on her upbringing in Tasmania for similarities in concept. Later photos that she took herself were in parks and based around taking snaps of wedding events. Some of these were composed to bring out some humour or a tell a story from an interesting interaction of the people in the groups. Many of her titles and themes draw on “classical” themes which have been attached to contemporary stories and a limited palette was used for added drama. Some of her work is just for fun and others are aimed at serious social commentary. As her career progressed she found that working from photos was restricting her in many ways. She also worried about the copyright aspect as this was being more widely monitored and upheld in the courts. The move to using live models (albeit friends and family in a lot of cases) was a good one as she was able to craft the paintings, as well as interacting with the model, which would help a lot in capturing their personalities. Over the past few years she has returned to her home and garden for her inspiration. Kristen feels that you don’t have to travel all over the world for subject matter. This is such a relief as many artists go to Europe and other places leaving many to think that if you don’t go to Italy or France for example, to paint and learn, you haven’t really completed your art education or are not extending yourself as a professional artist. Kristen finds great subjects in her own studio and especially in her yard. She paints them from life at all times of the day and all year so the light is vivid and the colours fresh. She works in water colours an oils and her works are of all sizes including some rather large pieces. She markets her works through only a couple of reliable galleries that she has built up a long relationship with. Kristen suggested that to get your career going that entering as many exhibitions and art prizes as possible is a good idea and also applying for arts grants and artists in residence calls. She also said that we need to make painting from life an integral part of our practice. Photos can only take you so far and they can flatten out colour and light that is required to make your art look fresh and painterly. It was also suggested that trying to second guess the art market can be a bad idea. Keeping your artistic integrity is very important as the market can change very quickly and if you keep trying to move with it, you will get lost and lose any idea of who and what you stand for. You can be miserable painting things that just aren’t you and still be rejected by galleries so you may as well stay true to yourself as many artists that have succeeded have stayed true to their vision. Kristen is an artist with a great deal of common sense and business sense as well and being near the same age as her I really could identify where she was coming from. Her art can be powerful and not what you may think would come from a female artist of her generation, which is another thing that I liked. It showed me that you can produce anything you want to as a female artist – better now than probably any other time in history. It is just up to you to work at it and put in the effort and dedication.